The year 2000 truly was momentous as I pause to reflect on it. I had the chance to participate in some fabulous climbs with old friends and the opportunity to forge many new friendships in the mountains. It doesn't get any better than that! It is especially gratifying to see the programs I have been working on for over 25 years continue to grow and increase in popularity. Highlights from the year 2000 include ushering the new millennium in from high on Mt. Rainier; returning to Ouray, Colorado for my annual winter ice climbing seminars; a successful spring on Mt. Whitney; revisiting Mt. Everest after a break of 10 years; and spending some quality time with friends on Mt. Rainier doing challenging alpine routes. I couldn't attempt to list each of the small, private trips I organized and led in 2000, nor the great times we enjoyed. However, following are some of the areas I visited and the events that transpired. My ice climbing seminars in Ouray, Colorado have been popular from the very beginning. The Ouray Ice Park provides the most dependable high quality ice climbing in the lower 48 states. It doesn't hurt that it is about a 5-minute walk from the door of our hotel as well. The weather is usually clear and sunny and the temperature is not too cold. What more do you want for an exciting winter getaway? In addition, I am one of the few permit holders for specific areas in the neighboring Forest Service land that hold additional climbing opportunities. On most of our programs we tune up in the Ice Park and then visit some of the nearby areas for one or more days of the program. These programs are tailored to all ability levels from first time climbers to repeat veterans. I can no longer lead every one of the seminars myself, but I go on several each year. Luckily, I have the best possible staff of veteran guides available. 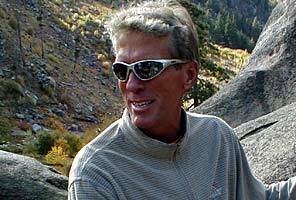 My Ouray guides include Jeff Ward, Jake Norton, Chris Booher, John Race and Mark Cionek. Jeff Barefoot, Doug Peterman, Clif Cassidy, Tim Crippen, Keith Cummiskey, Dan Cummiskey, Paul Later, Len Shulman, Iqbal Garcha, Perry Julien, Pat Luke, Michael McBee, Guy Orangio, Steve Bomar, Alan Dale, Gregory Fowler, Bruce Gierszal, Jeff Johnson, Gordon Reiter, Monica Rimai, Bill Gibson, Tim Barber, Suman Malempati, Melanie De Silva, Richard Hinkel, Justin Quigley, Rod Jessen, Cole Hanley, Marvin Beck and Craig Silverton. What started out as a one-time visit to Mt. Whitney in 1996 has turned into a multi-climb visit in the spring of each year. I love to do Whitney as a snow climb via the Mountaineer's Route on the east face. This route provides a little bit of everything: a two day snowshoe approach, a reasonable summit day from high camp at 12,000 feet; some practice on steeper snow slopes of 30 to 40 degrees; and a final summit headwall with an introduction to using mechanical ascenders on a fixed rope. This is a fun way to climb the mountain at an uncrowded time of year, and great training for bigger climbs like Denali. I contract this program with friend and fellow RMI guide Kurt Wedberg who guides on Whitney under permit with the Inyo National Forest. Unfortunately, I had to miss Whitney this year due to my participation in the Everest Trek, but Kurt and our regular team of guides including Chris Booher and Brenda Walsh did a super job. For the first time ever, one of our climbs failed to summit this year due to a snowstorm, but our record remains outstanding. I am looking forward to returning in 2001. Mary Miller, Mike Gibson, Chris Fragakis, Joseph Murphy, Greg Moe, Dave Morely Jr., Johnathan Morely, Peter Ruman and Martin Teague. Michael Golay, John Branstetter, David (Tim) Barber, Jay Long, Bill Maat, Suman Malempati, Scott Stout and Tom Wilcox. 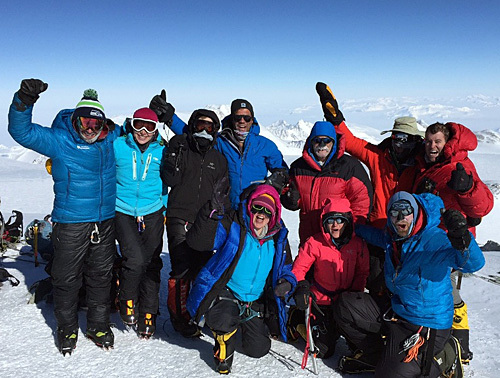 Eric talks about the Everest programs in his part of the newsletter, so I won't elaborate. However, I have to mention that I had the best time hiking into Everest Base Camp with the summit team. My four previous expeditions to Everest had all been to the North Side via Tibet so this was my first time to Base Camp from the South Side. We had a superb time and the Sherpa staff was the finest imaginable. I definitely had mixed emotions about leaving the summit team at Base Camp, but the group I took to Island Peak was lots of fun and we had a most enjoyable climb. I always said this would be a one-time visit to the South side of Everest, but I am already entertaining thoughts of a return. Maybe next time with my family. I can definitely recommend the trek into Everest without reservation! Eric puts together a first rate program. I missed climbing in the Wrangells for the first time since about 1987 due to the Everest Trek. Luckily I had some great guides to fill in for me. John Race led a two person private trip to the heart of the range for a first ascent of one of the smaller peaks. Jeff Ward led the regular trip originally slated to climb Mt. Sanford. Due to route conditions and last minute team changes he opted for a climb of neighboring Mt. Drum. Although he didn't summit, he reported high quality climbing and excellent weather. I am eagerly anticipating a return to the area in 2001. I will be leading an ascent of Mt. Blackburn, the last 16,000 foot peak in the park that I have left to summit. This is a climb similar in difficulty to Liberty Ridge on Rainier, just a little higher and longer. I am also planning on adding a second climb in the area, probably to Mt. Bona. This will be an equal challenge, but the climbing will be more glacier travel and not as technically difficult. I was in Nepal in the spring and had arranged for a friend of mine from New Zealand, Shaun Norman to lead the Logan expedition this year. Unfortunately, Shaun was involved in a nasty crevasse fall on Mt. Cook and severely broke his leg. We were forced to cancel the climb. 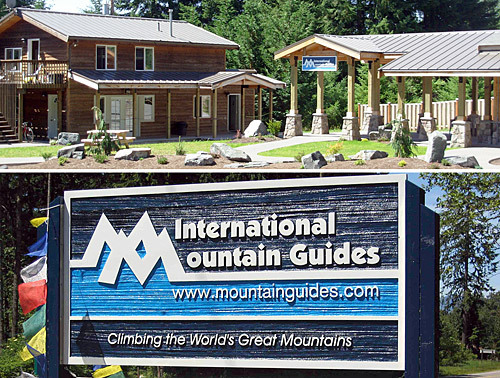 The Canadian authorities require that an internationally certified UIAGM guide lead all climbs of the mountain. This year I have arranged for a Swiss/American guide to lead the Logan expedition along with a long time friend of mine, Chas Day. Chas participated in two previous attempts on Logan with me and has been to the East Ridge as well on his own. The climb of Logan is every bit as much as climbing Denali, without the crowds and the mess. This is a great climb for Denali Veterans to aspire to. There is no better place in the world to visit during the months of July and August than the Dolomites of Italy. Beautiful scenery, excellent food and exhilarating climbing opportunities are the norm. This is a perfect trip to bring a spouse along. There are opportunities to hike, sightsee, learn the fundamentals of rock climbing and climb a couple of the classic "Via Ferratta" routes in the Dolomites. 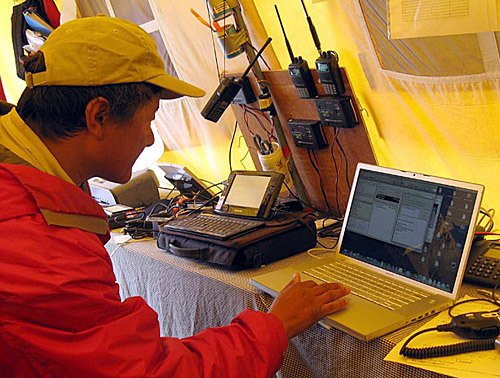 No previous technical skill is required, just a sound constitution and a good sense of adventure. Veteran guide Brent Okita leads this trip for IMG. He spent his early childhood in France and Italy and returns each year to lead programs for IMG. This is absolutely my favorite summer trip. I can no longer afford to lead this program every summer, so I now alternate years with lead guide Brent Okita. Paul Maier and Dave Hahn, make up the complement of highly trained guides for these programs. Brent, Paul and Dave are simply the very best guides you will ever meet. The summer of 2000 was a cloudy, stormy year in the Alps, but Brent Okita made the best of it and managed to pull off almost all of the regular climbs on the Classic Climbs in the Alps program. The group managed to climb the Jungfrau, the Monch, Mont Blanc and only fell just short of the summit of Monte Rosa. Rick Burns, Cindy Burns and Ron Houle. Paul Maier led the Advanced Alps program this year. By mid-August the local guides were still not summiting the Matterhorn, but Paul gave it a valiant effort. The best part of climbing out of Zermatt is the endless opportunities for climbing even in less than optimal weather. Unfortunately, the Matterhorn itself requires good weather and dry conditions for a normal ascent and that was not the case this year. James Goodman and Richard Terek for a job well done. I will look forward to my own return to the Alps in 2001. Come join me! I continue to wear several hats as a guide. One of my roles is Director of Winter Programs for Rainier Mountaineering, Inc. I love Mt. Rainier in winter and the superb opportunity for high altitude, cold weather expedition training it provides. The six-day Winter Expedition Seminar is the very best training to be had for Denali, Aconcagua and other high altitude expeditions. We have the chance to study avalanche hazard evaluation, we use avalanche beacons, and work on all of the skills necessary to participate in a major expedition. Sometimes we even get to summit Rainier in the winter, which is a special treat and a real mountaineering adventure. We almost always get high on the mountain, and even when we don't summit, the knowledge gained along the way is invaluable for future climbs. In early June I always like to take a crack at one or more challenging climbs on Rainier. My all time favorite is Liberty Ridge. This last year we made a successful ascent of the route in excellent conditions. My congratulations to Sean Gallop, Ken Jern, Dan Backer, Tim Ulrich and guide Mark Tucker for a job well done. I plan to attempt Liberty Ridge again June 1-4, 2001. Contact Rainier Mountaineering Inc. for more details. 2000 has been a good year, maybe better than I have a right to expect. A few health issues set me back a bit during the fall of 1999. I wasn't able to personally lead any of my expeditions from August 1999 until February 2000. Fortunately, we've got good friends who just happen to be excellent guides and they were a huge help by filling in for me. Many thanks to Craig Van Hoy, Heather MacDonald, Greg Wilson, and Tap Richards for leading expeditions during that period. Things slowly started coming together late in 1999. My wife, Sue, an old guide friend named Tracy Roberts and I hiked up a local mountain on December 31st. Things were back on track. This summer was one of my busiest in years. I spent several weeks on Rainier working for Rainier Mountaineering, Inc. It is a great place to go to test one's conditioning and to prepare for other expeditions. Trips to Ecuador, McKinley, Russia, Kilimanjaro (3 times) and Mexico rounded out the summer/fall season. Vinson Massif is on the schedule for November 20th. Doing these climbs was the best way possible to get back into shape and make sure everything was back to normal. We had to cancel a planned expedition to Everest for the spring of 2000. We are now committed to making our attempt on Everest this coming spring. Susan and I are trying to complete the Seven Summits together and Everest is the only summit remaining. I can't think of a better reason for me to return to the Big E. Greg Wilson, John Waechter and Andrew Lufkin will be climbing with us, hopefully, to the summit. Wish us luck. The following is a brief review of this past year's expeditions. It was a good one. Lots of great climbers, a good percentage of summits and everyone came home with ten fingers and ten toes. 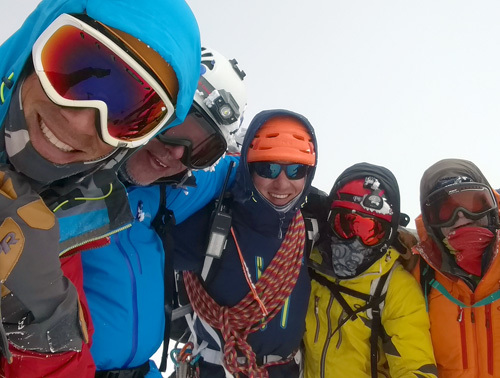 Guides Brent Okita and Heather MacDonald hoped to celebrate the New Millennium by being on the summit of Vinson Massif with their team in early January. Sometimes, however, you just can't buy any good luck when it comes to the weather. We've had incredibly good fortune with the weather on all our previous Antarctica Expeditions. In fact, we've had never missed the summit. The January 2000 expedition experienced weather delays from the get go. Finally, their two team members were forced to make a very difficult decision. Jobs and commitments were waiting back in the States they could devote only so much time to the climb. Doctors Martin Greene and Ray Gammon returned home but encouraged Heather and Brent to stay as long as necessary to complete the climb. The weather finally broke for a short period of time and Brent and Heather were able to make a rapid ascent and catch the next flight that was able to reach the Ice. We would have preferred to see all four climbers reach the top but at least two were able to stay long enough to summit. Thankfully, the team didn't have to spend as much time down South as did Shackleton during his epic expedition from 1914-1916. Now that was a serious delay! I will be heading for the Ice two days after writing this newsletter. We've got a strong team of four climbers plus me and I hope we'll have completed a successful climb of Vinson Massif by the time all of you read this. If you've ever considered going to the Antarctic and taking a shot at Vinson, don't wait too long. Getting to the interior of Antarctica involves some fairly complicated logistics and I've always wondered how long this will be available to private citizens. Sooner is probably better than later. Join me next November. I'll be ready to go. It was another busy year on Aconcagua. Tap Richards and Adam Angel led the January expedition and Heather MacDonald and Kent Wagner climbed with the February group. These two months normally afford us the best chance of getting reasonable weather and reaching the summit. We'll have groups on the mountain again this season during January and February. Tap's team was able to summit in January 2000 but Adam wasn't with them. A loose rock caused Adam to slip while returning from a carry to Camp 1. His thumb was injured and required him to return to the States for medical attention. He will be with this year's January group for a rematch. Heather's group in February 2000 got close, very close, but turned back short of the top. Kent had returned with a couple of team members during the summit push and Heather continued upwards with the rest of the team. With less than two thousand feet remaining, an addition team member had reached her limit. Heather made the correct decision when she and the rest of the team accompanied that member back to high camp. Being a team means just that, you do what is right for the team. Sometimes that is in conflict with your personal desires but that is what makes this sport special. Aconcagua is a very big mountain and you simply cannot afford to take chances or make mistakes up high. There is always another summit day. Ecuador is always a great trip and I get down there at any opportunity. Greg Wilson led a strong group of eight climbers there in January 2000. We climb with Ecuadorian guides Romulo Cardenas and Jorge Anhalzer. I've known these men since 1980 and they make this one of the most enjoyable programs I run. Don't miss this trip. You will attempt two beautiful, challenging mountains, see one of the most beautiful countries around and meet some of the nicest, brightest guides I know. I even took a 'bus man's holiday' there in February. My wife, Susan, and a friend of ours, John Waechter, joined me for ten days of climbing, sightseeing and just plain fun. Our June 2000 group found beautiful conditions, especially on Cotopaxi. I don't think I've ever had a better combination of weather and snow conditions on that mountain. What a pleasure. Romulo did a super job for us and the team bonded well. I know I'll be climbing with several members of that group again, soon. I'll be personally leading the January 2001 expedition to the Ecuador volcanoes and also the expedition in June 2001. Let's go. I actually spent a fair amount of time on Mt. Rainier this summer and took a group to McKinley as well. 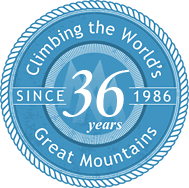 I began working for Rainier Mountaineering, Inc. in 1971 and George Dunn and I continue to spend time on the mountain each summer. George now has more summits of Rainier than I do but not many more. I'll find a few extra weeks one of these summers and regain my title. Until then, he will continue to remind me that he is in the lead. Three groups climbed with me on Kilimanjaro this summer. Eric and I have trips there throughout the year so I'm sure you can find a date that works. Bring your athletic spouse or significant other, a son or daughter, a good friend or all of the above and join me. It's amazing how much we can pack into a two week period. I had 28 climbers with me on Kilimanjaro this season and 27 reached the top. The one climber who turned back early was one of our strongest members. It took a bout of asthma to keep her off the summit. I really like the itinerary that we've established for this program. We have seven days and six nights for the climb. That allows lots of time for acclimatization and we get to our high camp early in the day. That allows us plenty of time to pack, rest and prepare ourselves for the midnight start towards the summit. On safari, we charter a small aircraft to fly us to the Ngorongoro Crater. It is an unbelievable flight and cuts out a big chunk of rough safari driving. It would be difficult to not enjoy yourself on this program. I'll be personally leading the August 2001 trip and we'll also be there in late September 2001. Will you be with us? Between Kilimanjaro climbs, we did a quick trip to Russia and Mt. Elbrus. I wanted to see first hand what the current situation was like. We had great weather and everyone on the team summitted. We will be running a trip to Elbrus in July 2001. We do this trip right. By going in through St. Petersburg and out through Moscow, our climbers get to see as much of the country as possible. We also schedule sufficient time near Mt. Elbrus to get in some training days and possibly do a second alpine climb in that area. Add to the mix the quality of the Russian guides with whom we work. These men are great climbers and good friends. They are instrumental in moving us through the country, making all our connections and climbing with us on the mountain. Having long time connections and friends like these make our programs special. Elbrus is one of the Seven Summits and this program is the way to climb it. Less than two weeks ago I was with a group on the Mexican volcanoes. No one runs a Mexico program quite like this. We use a unique approach route to climb Ixta via the Ayoloco Glacier. It's more expensive for us to do things this way but it is, without a doubt, the best way. It's remote, very scenic and affords us the best opportunity to acclimatize. The trip allows you to leave your home on a Saturday and you're back home the following Sunday. Where else can you attempt two very big mountains, see another country and spend time in the sun with great partners and only be away from work for five days? My November group drank way too much tequila during our celebrations the last night in Mexico City but they still managed to catch their morning flights home. We had a super team and a super trip. One of the team members is out hiking with my wife even as I'm writing this newsletter. I'm working on one new trip for 2001. I've always wanted to see Bhutan and Nawang Gombu has agreed to accompany one of our groups and me to that remote mountain kingdom next October. Opportunities like this don't come around often and, if a Himalayan trek is in your future, you might want to give me a call. I can hardly wait. 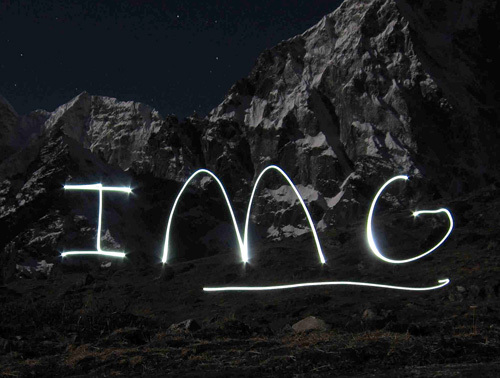 Gombu worked with us a few years ago on a Sikkim trek and this new program should meet that same standard. For those of you who do not know Gombu, he was the first man to climb Everest twice and has been running the Himalayan Mountaineering Institute in Darjeeling, India for years. He is a prince of a man and, again, this is what makes programs like this unique and so memorable. Join me on this one. I don't think you'll be disappointed. Click for trip page. Andrew Lufkin, John Waechter, David Whitney and Frank Howington. Steve Matson, Jeff Matson, Mark Levitan, Mike Lewer, Brian Burroughs, Brian Scantamburlo and Ralph Quade. Paul Greenberg, Jeff Ligman, Douglas Wells, David Walker, John Merrill and Knox Kerr. Tony Macchiaroli, Angela Wittenberg, John Tury, Butch Ukura, Rob White, Rick Reis, Tom Reis and Jim Reis. John Harknett, Leland Kern and Kevin Slotterbeck. Roy and Chris Sanford, Tom, Marita and Karl Holzer, Marth Kilcoyne, John Voyta, Ingrid Holzer, Tom Fries and Kate Lewis. Ralph Rydell, Robert Isbell, Gertrude Keenan, Arlene Hanson, John Dahlem, Ryan Dahlem and Steve, Cathy, Christian and Hayley Hawes. Van and Debbie Wagner, Chris Miller, Cara de Urioste, Peter Schmaltz, Liz Freeman, Jay Wagner and Gary Mohr. Jill Jones, Wynne Leon, Paul Greenberg, Phillip Corwin, Trent Carey, John Tury and Mary Hannon. Looking back on the year 2000 I realize how fortunate I am. The climbing business that I started doing nearly 30 years ago is still fun and challenging, I'm still reasonably healthy and not too decrepit, and the future looks good. Perhaps most significant to me personally were three milestones that I passed in 2000: I made it to 45 years old, my wife Erin and I had a little daughter (Audrey Carolyn), and finally, I am now an official Seven Summitter! In fact I now hold the official record for the longest time it took someone to do the Seven Summits. I first climbed McKinley July 10, 1974 and made Kosciusko on April 5, 2000. By my count this is 25 years and 269 days! I'm particularly pleased to report that this was also a great year for our Himalayan Programs. We were successful on both Everest (South Col) and Cho Oyu (spring and autumn), and also had great trekking programs associated with all three of these expeditions. The Kilimanjaro trips were smooth and successful. One of the biggest changes for me this past year was the many lectures and presentations I did, predominantly about our 1999 Mallory and Irvine expedition. I traveled around the country on a book tour hosted by Mountaineers Books, and also visited several international destinations including Sydney, Singapore, and England. The many people I've met, constantly remind me how the Mallory story has hit a common note with individuals of all backgrounds, not just climbers. The idea of trying to do a difficult thing, even though success is hardly certain, is something we all tackle in our daily lives of family and careers. I stayed home Spring 2000 for the birth of Audrey, the first year since 1992 that I haven't been to the Himalayas, and only the second year since 1988. No regrets...everyone did fine without me, and I had a wonderful experience on March 22 with little Audrey showing up as our climbers were in Kathmandu! For our 2000 Everest trip I joined forces with George Dunn and veteran guides Robert Link and Greg Wilson to put another successful Everest team on Nepal's South Col route. Five expedition members, including Dave Hahn (climbing correspondent for Quokka.com) and Michael Brown (expedition filmmaker) reached the Big Top, while climbers Steve Greenholz, Mike Dunnahoo, Tom Wise and Kim Gattone each gave the mountain a good run with Greg and Robo. The expedition was featured on Quokka.com and will be the subject of a documentary film to air later this year (tentatively December 23 on NBC. As they say, check your local listings!) The summit team was joined by a hardy group of climbers going after the Khumbu Icefall and a great team of Base Camp and Island Peak trekkers led by George Dunn. Suffice it to say, a good time was had by all. Albert Beunza, Michael Brown, Ed Charette, Marilyn Danowski, George Dunn, Mike Dunnahoo, Mark and Jane Dwyer, Bob Eaton, Kim Gattone, Bruce Gierzal, Steve Greenholz, Dave Hahn, Carston Johannsen, Robert and Cari Link, Dan Morrison, Deke Morrow, Liza Paschall, Chuck Przybylski, Chris and Lindsay Reither, Ron Rhodehamel, Geoff Sacco, Marc Tabereaux, James Wiglesworth, Greg Wilson, and Tom Wise. This has been a good year for Cho Oyu. Both the Spring and Autumn expeditions were successful and our teams have now summited 61 persons on our eight expeditions to the world's sixth highest mountain. While Robert and Greg were on Everest, less than 20 miles to the west, the IMG Spring 2000 Cho Oyu expedition team was also bagging the summit, despite some very challenging weather patterns and snow conditions. Expedition Leader Craig John and senior guides Jake Norton and Tap Richards did a great job, waiting out Mother Nature to time the summit bid right. Finally Craig tagged the top with Western team members Stuart Smith, James Crichton, and Aaron Miller, and five of the great Sherpa climbers on the team on their second attempt (the team retreated from Camp 2 on an earlier bid, due to bad weather). In the Autumn 2000 our Cho Oyu team was 100% successful, again despite some challenging weather that kept many of the other expeditions from making the top. Expedition Leader Tap Richards, assistant guide Heidi Eichner, and team members Greg Yanagihara, John Matthews, and Joseph Coughlin along with our extraordinary Sherpas Kami and Phunuru reached the summit on September 25, and were able to descend back to Camp 2. This formula has proven itself to be very successful for us. We use oxygen on summit day above 24,500 feet (Camp 3) and try to get everyone up and down out of the "death zone" as fast as possible. Its not a good place to "hangout"! The Cho Oyu and Everest Base Camp trekking team also had a great trip, going first to ABC at Cho Oyu with the climbers (some of the team even made it up to Camp 1) and then traveling to Rongbuk afterward for an intimate view of Everest Base Camp on the Tibet side. This is a very unique trip... lots of fun. Jasmin Ajanovic, Kris Jett, Lydia Jett, and Matt Nielsen. Kilimanjaro remains one of our most popular programs. 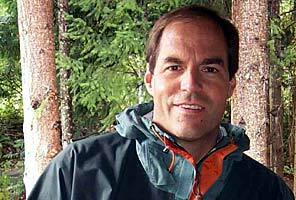 I conduct expeditions in the spring and summer, and Phil Ershler runs the autumn trips. As you probably know, Kilimanjaro sits nearly square on the equator, and does not have four seasons. Instead it has "wet" and "dry" seasons. Generally the "dry" seasons are January-March and mid June-October. Keep in mind that you can get rain any time of the year in the heavy forest that surrounds the lower slopes of the mountain. January, February, and June are particularly good for wildlife viewing, as our groups are able to go to the Serengeti National Park, then to Ngorongoro. In the autumn, there are not so many animals in the Serengeti, in which case we go to Tarangire Park, which has a year round river that attracts many animals from afar. One of the things that really makes Kili so special is the friendship we've developed with Michael (Nelson) Ntiyu, our Tanzanian guide who leads our Kili trips along with our IMG guides. Michael has climbed Kili well over 100 times. In addition to speaking good English and being a terrific guide, Michael also joined us on Mt. Everest in 1999 when I invited him onto the Mallory expedition. Michael climbed as high as the 23,000-foot North Col, his first time on hard ice with crampons and fixed ropes! 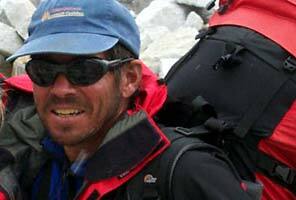 Craig John led our January 2000 and February 2000 Kili trips. Craig has now led Kili about eight times for me, and he does a great job. A long time guide, Himalayan vet (Cho Oyu and Everest summiter) and all around good guy makes Craig a terrific Kili leader. Our June/July Kili trip was led by longtime guide extraordinaire Greg Wilson. James Bjorgen, Thomas Schack, Jane Gallion, Evelyn Brady, Doug Daubert, Ronda Vanderhoff, George Tracy, David Tracy, Charlie Peck, Shawn Peck, Larry Marken, Sam Wiedermann, Patricia McPherson, Paul Bridge, and Jeff Ragsdale. I've been trying to go to Carstesz Pyramid in Irian Jaya for about four years now ever since I finally climbed Mt. Elbrus back in 1996 (which took me three tries...talk about bad luck with the weather!). It seems like every time we get a group together, the political situation in Indonesia deteriorates, making it unwise to go. This happened again this past November to my group of eight (asst. guide Greg Wilson, Stuart Ellison, Barb Gurtler, Lori McGuire, Lee Meyers, Peggy Foster, and Gary Dietrich). It was a real bummer, but when the US Embassy in Jakarta issued a formal travel advisory, I felt like I had no alternative but to cancel the trip. This was only the second time in twenty years that I have cancelled an expedition... out of over 80 trips that I have now organized. I hate to do it, but it's safety first in my book, no matter how bad I want to climb Carstensz Pyramid. It will still be there, and if things settle down a bit in Indonesia, we'll take another crack at it in the future! I'd like to say a few words about Mt. Rainier, a place where many of you started climbing (just like me!) As perhaps you know, I have had my own limited guiding permit (as Mt. Rainier Alpine Guides) via the Emmons Glacier route since 1997. Our climbs are limited to 8 climbers and staffed by 4 guides, so it's quite an intimate program. Additionally, we conduct an eight-day mountaineering circumnavigation of Mt. Rainier at the 8,000-10,000 foot level of the mountain. For the upcoming 2001 season our Emmons climbs are already filled up. The circumnavigation trip still has space on it. 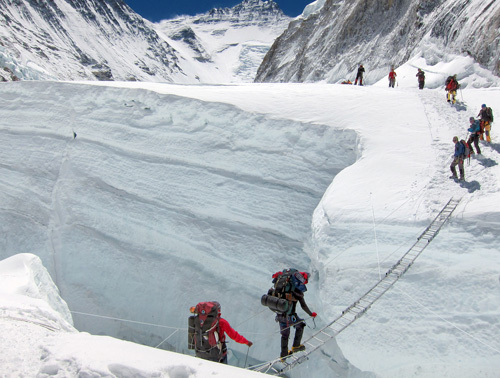 It's a fantastic mountaineering adventure...crossing 15 glaciers and intervening ridges. Please get in touch if you are a strong climber looking to do something really different!